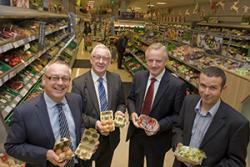 Quentin Clark, Head of Sustainability, Waitrose Derek Davies, Adare Professor John G. Hughes, Vice Chancellor, Bangor University Biocomposites Centre, Bangor University.A collaborative project led by the BioComposites Centre at Bangor University, in partnership with Aberystwyth University and Waitrose was on show at the Waitrose Menai Bridge store recently. 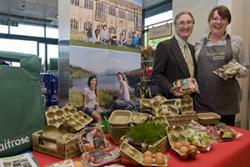 The STARS project, funded with support from the Welsh Government through the Academic Expertise for Business Scheme, has been turning grass into a range of products including biodegradable packaging for supermarket products and biofuels for transport, in collaboration with Waitrose and several industrial partners. Bangor University has focused on producing food packaging from the grass fibre, while Aberystwyth University has been working on the conversion of grass juice to biofuels. The idea behind the grass packaging is that this material fibre can go into the same compost bin as the food it was used to display, giving an environmentally alternative to the tons and tons of plastics we are using today, reducing landfill and in turn the environmental impact on our planet. The Waitrose store hosted a display of the range of products that have been produced as a result of this collaboration, and the group were canvassing the opinions of the general public during the day in order to feed back into their research and development. Dafydd Roberts, research technician, Biocomposites Centre, Derek Davies, Adare; Quentin Clark, Waitrose; Nick Laflin, Chief Technician, Biocomposites Centre; Professor John G. Hughes, Dr Adam Charlton, BioComposites Centre.All the packaging on show is made on Anglesey at Bangor University’s Research and Development facility at Mona, so not only is the product environmentally friendly it has not travelled miles to get here. The group has been proud to work with local companies and producers to create a truly Welsh product. The project partners visited the store to look at the display at 2pm on the day. 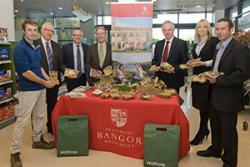 Bangor University’s Vice Chancellor Professor John G. Hughes and Waitrose’s Head of Sustainability Quentin Clark along with Derek Davies from Adare, one of the project partners who supplied the equipment that was used to produce the packaging, attended the event. Quentin Clark from Waitrose said: "Waitrose has been very pleased to have been involved with this work for a number of reasons. Obviously, the opportunity to explore novel ways to create more sustainable materials, such as packaging, holds its own attraction but this has been a great demonstration of a more open approach that shows how academia and business can work together, each contributing their expertise, to help deliver real, practical science to the market"
One other interesting angle to this project is that the wife of Nick Laflin the Chief Technician for the project is a partner at Waitrose!